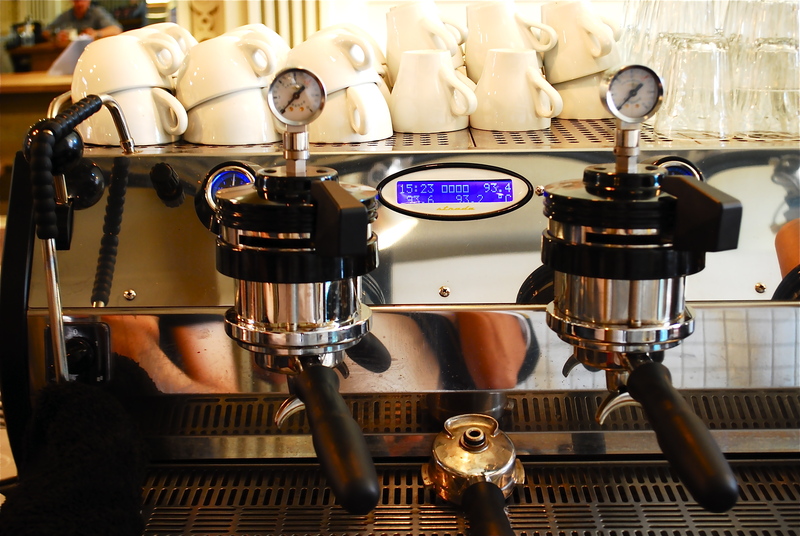 Josh, the barista, was busy and introducing myself briefly, I asked if I could take a picture of this lovely machine….. Warning ! coffee geek inside. So, I snapped away and then obviously asked for a Strada made espresso, which he made, using Square Miles’s Capao, extracted at 93 C – a bit bright for me with such a bean, which I believe is best extracted at a higher temp to highlight the nutty caramel toffee flavours. From one coffee expert to a geek, Josh kindly declined to accept payment. There ! I had had my first LM Strada coffee, yipee ! And yes, it was still delicious and yes, Flat White are the only cafe that Sqaure Mile Coffee create a blend for. 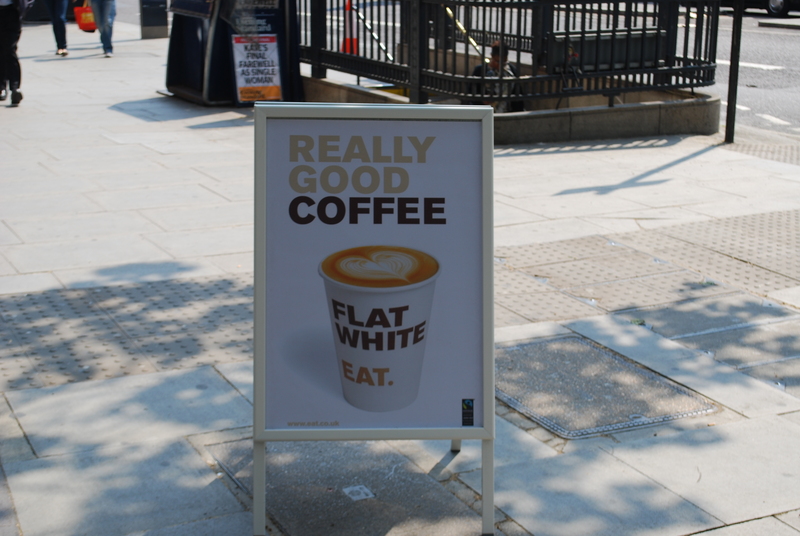 I actually finished my London tour, hours before my flight back to Cape Town with a visit to Flat White’s sister (why don;t they say brother ?) shop, Milk Bar on Bateman Street in Soho, where I had a fantastic espresso experience. I mean, who takes 5-7 minutes to make you an espresso ? The chief barista (I forgot his name, shame on me) at Milk Bar does, especially if he sees someone come into the cafe, order espresso and then ask him how long he’s doing the pre-infusion for, whilst admiring the Robur E Mazzer Grinder (the daddy of all daddy grinders). The first shot, which he didn’t want me to drink, went right through my tongue like a rocket, with a nutty like taste and the second, kind off filled my mouth, wrapping itself around the edge of my tongue and then coming back in – wow ! No pic, as I was struggling with last minute shopping, but nevertheless, a great culinary experience. Last but not least, it was a trip I had been planning even before I packed my suitcases for my trip, a trip to Kaffeine, 66 Great Titchfield Street, London W1, winner of Europe’s best independent coffee shop and more recently, winner of Britain’s best sandwich and coffee shop. 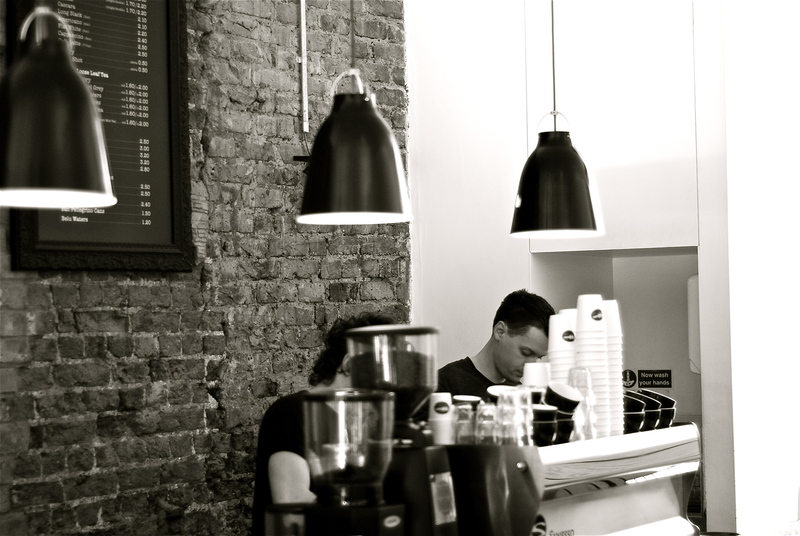 I think I should mention this up front as it’s been on my mind but what is with Aussies and coffee and why are they ruling the London coffee scene ? I can only stand by and admire and wish they would come to Cape Town and help me out with converting the masses to a great brew, but lucky London. OK ! I digress, we are at Kaffeine, my first priority on my last leg in London, which I visited on Saturday morning in the area known in London as Fitzrovia, which means the space in between Regent’s Park and Oxford Street, parallel to Great Portland Street – a quick geography lesson for non-Londoners. 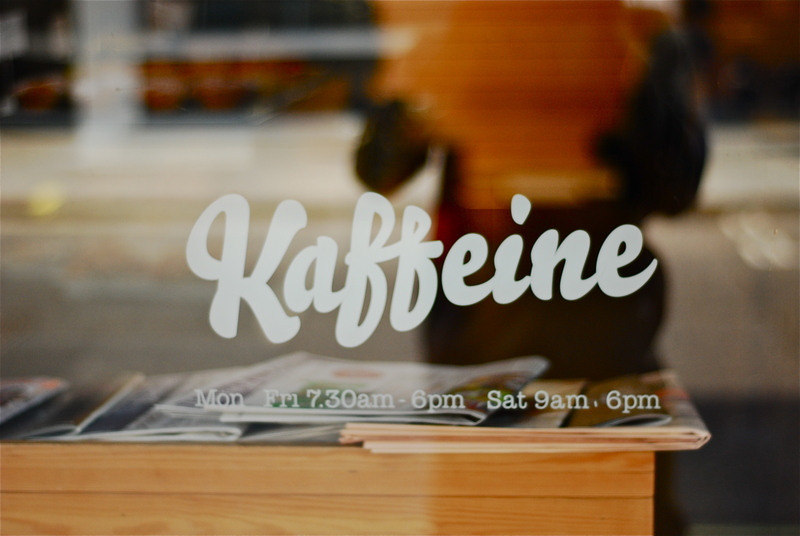 I really loved the simplicity and yet high quality finish of Kaffeine, which incidentally is small and cozy and was quiet when we arrived around 11am, but I was told on a normal day, 570 cups are the norm and on a quiet day, 200+ (Oh London ! should I have opened my cafe in you ?). 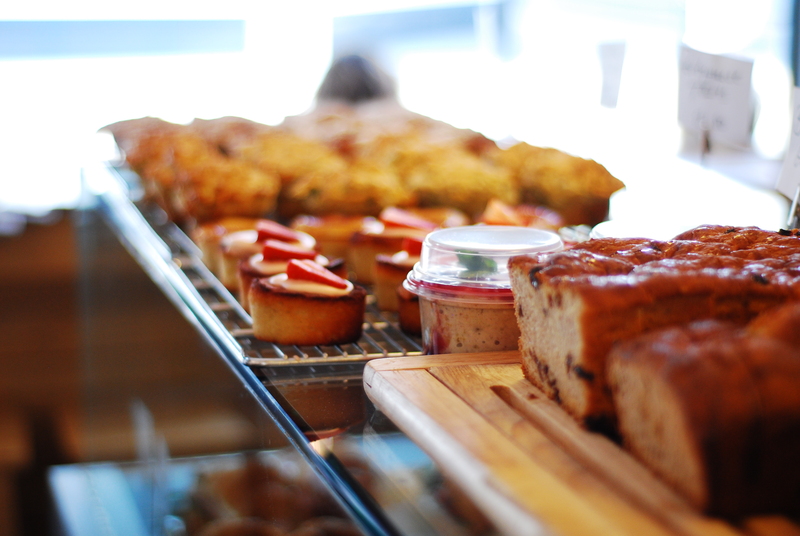 As you enter Kaffeine, you are tempted by delights like strawberry friands (another great Aussie invention) and yes I was tempted and asked for one to go with my flat white. 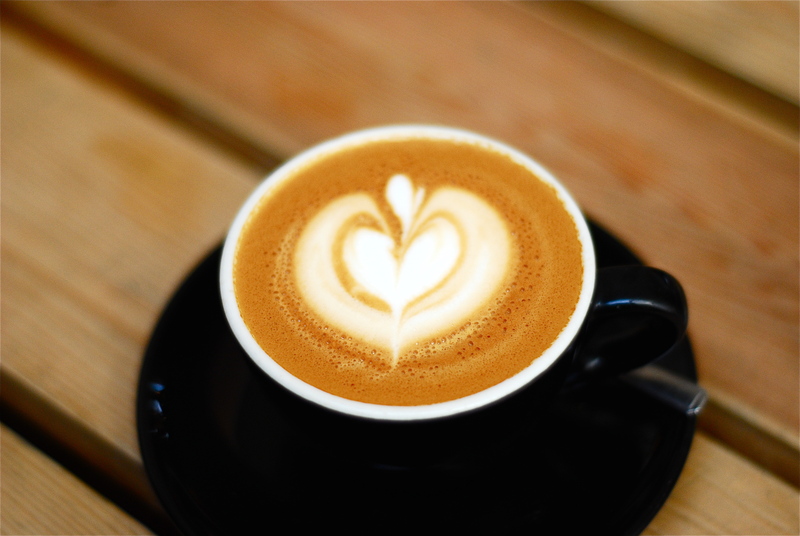 I brought an old University friend with me and asked him to try a cappuccino – “wow ! coffee can taste like this, now I know why you are so crazy about coffee Lameen” was his reply after his first sip. Kaffeine have a Synesso Cyncra, use a Robur E (but of course) and Square Mile Coffee and are led by top barista Cathy, who kindly gave us complimentary coffees, spotting the coffee geek in me. The staff were very attentive and one promised to visit Cape Town very soon – so watch this space if he does, as I might offer him a temp job, before he heads back to London. Go Kaffeine Go and well done on all your achievements. Can’t wait to visit again. That’s all I can say and well done London, Londoners for appreciating great coffee and I’m sorry, but I have to say this, Aussies for helping out with the quality, et al.